Pilar speaks to Hugo Messer about leading remote teams and the importance of values in creating a culture that works across nations. Hugo is the CEO of Ekipa, the global market for software teams and owner and founder of Bridge Global. 00:30 Pilar talks about how she met Hugo through social media. She reflects on how these conversations evolve on the podcast and the importance of devoting our full attention to the person on the other end of the line/skype etc. No distractions (we need a quiet environment for recording) and the focus on connecting with the other person. 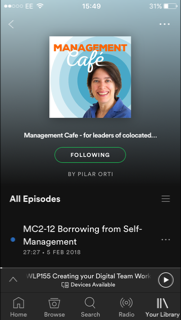 Pilar mentions Hugo's article on LinkedIn The World's Best Tool for Remote Leadership. 11:20 Hugo shares how and why he set up Bridge in 2005, when outsourcing was not that common. 16:00 The model/framework that Bridge has developed to match teams and clients. The role of the "process manager" who looks solely after communication. 29:50 Moving on from Bridge and setting up Ekipa. 35:50 What are the major problems faced by people running virtual teams? Links to another article by Hugo: Six Experts Reveal Insights on Remote Team Management. 45:50 How can we help people to develop in remote teams? Hugo's own development, why he works with a coach. Are we allowed to be confused as leaders? 52:00 How do we know people are doing the work? Hugo's article about this on LinkedIn. "The moment I start wondering about somebody’s hours, something is definitely wrong."